Gipuzkoa. Home of the most beautiful city I’ve seen. Gipuzkoa is one of the three Basque provinces located on Spain’s north coast, or, to listen to most Basques, the part of the world located between Spain and France on the Cantabrian Sea. While it seems that Gipuzkoa is in a bitter rivalry with neighbouring Basque province Vizcaya (Bizkaia) , there is no reason as both places are amazingly beautiful with many unique places to visit and a fascinating history. Gipuzkoa is also the smallest province in both the Basque Country and Spain. It’s small size just means there is a lot of beauty in a small area. As I’ve been to Donosti, as the locals and lovers of the city alike call it, several times, I sort of have a routine going on now that includes a walk along the picturesque beach of La Concha (Kontxa in Basque), sitting on the walls close to Plaza de 31 de Agosto (my mom’s birthday, so I love this part of the Old Town!) and watching the waves crash where the Bay of Biscay meets the River of Urumea, a pintxo or two in the Parte Vieja, and a “relaxing café con leche” at Pokhara near the Buen Pastor (Good Shepherd) Cathedral. If I have time, I walk out past the Palacio Miramar to see el Peine del Viento (Comb of the Wind) sculpture by Chillida and a hike up Mount Urgull to see (a statue of) Jesus. This hike provides some of the best views of the city, although I have to admit my days on the Camino de Santiago coming into the city from Pasaia last summer and this summer leaving the city on Mount Igledo also offer amazing views on what I think might just be the most beautiful city in the world. There are three major downfalls about “the posh neighbourhood of Bilbao”, as the people of Bilbao refer to it. One is the weather. The Atlantic Ocean can get rather mad and drops a LOT of rain on the North Coast of the Iberian Peninsula. Number two is despite being a city of less than 200,000 people, it is one of the most expensive cities in the peninsula. Bilbao is a lot cheaper for being a lot bigger. The third is the surprising bad conditions of the bus station, which is more accurately called “parada de autobuses” in Spanish, or bus stop. I don’t know why the three province capitals in the Basque Country have such horrible bus stations when everything else related to transport is top-notch. 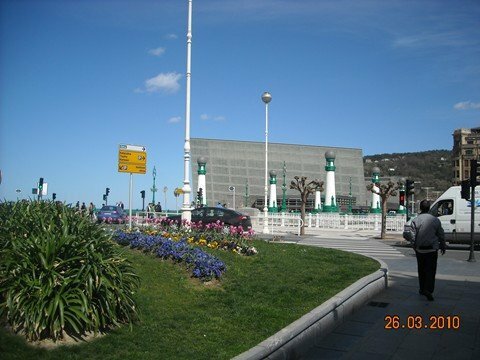 Also, my friends who visited Donostia a little bit okay mentioned that they think the Kursaal Palace, which is lit up for different festivals and where the film festival is housed, was an eyesore. I don’t mind it, but I do understand why someone would feel that way. One of the most incredible beaches I’ve been to in one of the most incredible cities I’ve visited. The steel sculpture by Eduardo Chillida is one of the most famous symbols of the city, although they were just finished in 1976. Located at the edge of the Kontxa Bay, these sculptures are where the wind and water meet. If you’re lucky, you’ll get to see some waves crash upon them. Just be careful not to stand on those grates too long or you will get wet! Hondarribia (formerly known as Fuenterrabia) is a quaint village of around 16,000 habitants on the Bidasoa River that separates Spain from France (or South Basque Country from North Basque Country). It has a fantastic medieval part, complete with a castle that is now a Parador (the chain of Spanish hotels made from old castles). However, the most famous pictures all include the brightly painted houses that look something out of a Swiss village. Hondarribia also has extensive beaches. Orio is a small fishing village of 5000 people along the Camino de Santiago. I first found out about this incredible place when I was on a bus to Zarautz in 2012. I took note of the name and went back my birthday weekend last year, and I also revisited it on day two of the Camino. I like how the church is built with a bridge across to the building nearby. Anything to make the churches of the peninsula stand out from each other! It also has ton of natural beauty and a great beach, of course. Pasaia is a very short day trip from Donostia five kilometres from the Gipuzkoan capital, just on the other side of Mount Ulia. It’s a stop on the Camino de Santiago and houses an albergue. My favourite feature of this town that sets it apart is the water taxi. For the price of 75 cents, you can make the passage (guess what Pasaia is Basque for) between two of the town’s neighbourhoods. San Juan is the prettiest part. A medieval town of 15,000 habitants located in the mountains of Gipuzkoa, Bergara is a nice getaway and super “Euskaldun” or Basque. 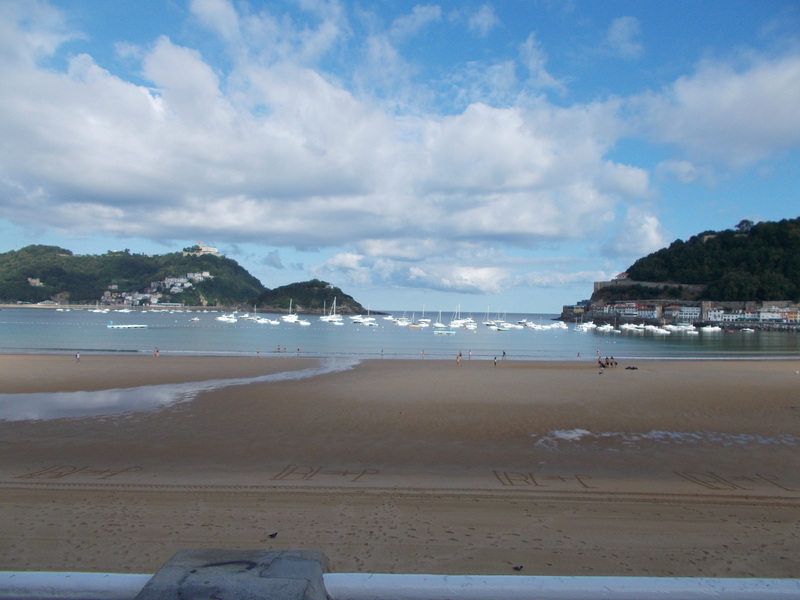 It’s a nice getaway from it all and well communicated between the three Basque capital cities. Zarautz is world-famous for surfing. The population nearly triples in size from its normal 22,000 habitants every summer because of its 2,8 kilometre-long beach. Even Queen Isabella II of Spain and Queen Fabiola spent their summers here. It has a nice city centre, but the beaches are the main attraction. It’s also a stop on the Camino de Santiago, and most guide books for the Camino suggest Zarautz as the end of the second day. Asturias. A northern paradise. Puxa Asturias! During my quest to visit all 17 autonomous communities (comunidades autonomas) of Spain, I sort of saved one of the best for last. Everyone always told me Asturias was a beautiful place, albeit rainy like the entire north coast, and even in Vicky Cristina Barcelona, Juan Antonio whisks the American girl off to Oviedo, the capital of Asturias. Like so many of my favourite places, Asturias is home to mountains and sea. It is a place full of history and tradition, a place of good food (like fabada) and good sidra (hard cider). It’s a bit off the beaten path (a five-hour bus ride from Madrid to a rainy climate deters a lot of tourists), but it is one of the most enchanting places I have ever visited. My first visit was in 2011 during the Puente de Noviembre, and my second visit was one year later during the same long weekend. I coincidentally stayed at the same pensión across from the train station. My first time was one of the few times I treated myself to a taxi as I was so lost. The taxi driver laughing, as it ended up being two minutes from the bus station. Rookie mistake, but it was better than walking around lost with all my luggage! 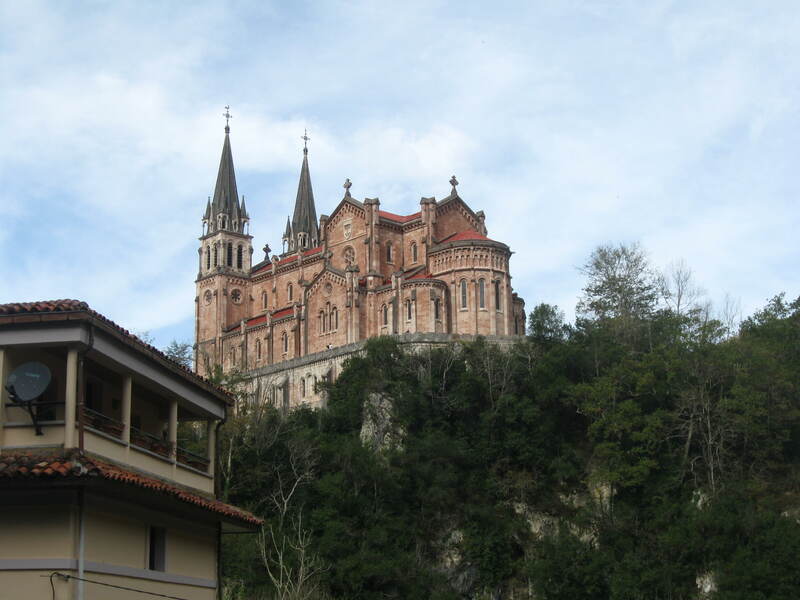 That first visit, I explored Oviedo and Gijón, and I went to Cangas de Onis (more later on Cangas). Gijón is one of the rare cities on the sea that I didn’t like. People complain about my current home Bilbao as being grey, ugly and industrial, but I found Gijón to be much more grey and “ugly” than Bilbao, the city of rejuvenation. Oviedo is beautiful, although it’s quite far from the sea. It may have been as I went in the autumn and not summer, but I found it a livelier city than Gijón too. Both cities are about 200,000 people. The impressive places in Asturias are the small villages. Asturias is a rural community with incredible landscapes. It shares with Cantabria and León the Picos de Europa, some of the most spectacular mountains in the entire peninsula. It has the rugged northern coast. It was my second trip in which I discovered the smaller villages. A return trip to Cangas, of course, taking off on a random hiking route along the river the famous Roman bridge crosses, then racing to catch a bus to Ribadasella made for the sunny day on that trip. I visited Cudillera, an incredible village built into the mountains, on one of the rainiest days ever. The sun came out at the end of the visit, at least, giving me a much more cooperative time to visit this village. Every place I’ve visited in Asturias I want to revisit. Asturias has many more than seven wonders, making it hard to settle on just seven. The cross hanging from this Roman bridge (which is actually medieval) is the symbol of the comunidad autonoma of Asturias. The Christian reconquest of Spain began nearby in Covadonga, and the cross is an important symbol for Asturias (and for Spain) as a result. The bridge is breathtaking, and there is an odd feeling of peace just being near it. The River Sella is also quite beautiful. The village attracts tourists for the bridge, but the actual village is worth seeing. There are nearly 7,000 habitants, and the breathtaking scenery from Oviedo makes it well worth the drive. You’re in mountains (at the very beginning of the Picos de Europa), and the village and mountain landscape make Cangas de Onís well worth the effort to check out. Not far from Cangas de Onís is Basilica de Santa María la Real de Covadonga. It reminds me of a Disney palace, and I felt much more like I was in Germany or France than Spain when I visited the Basilicia. 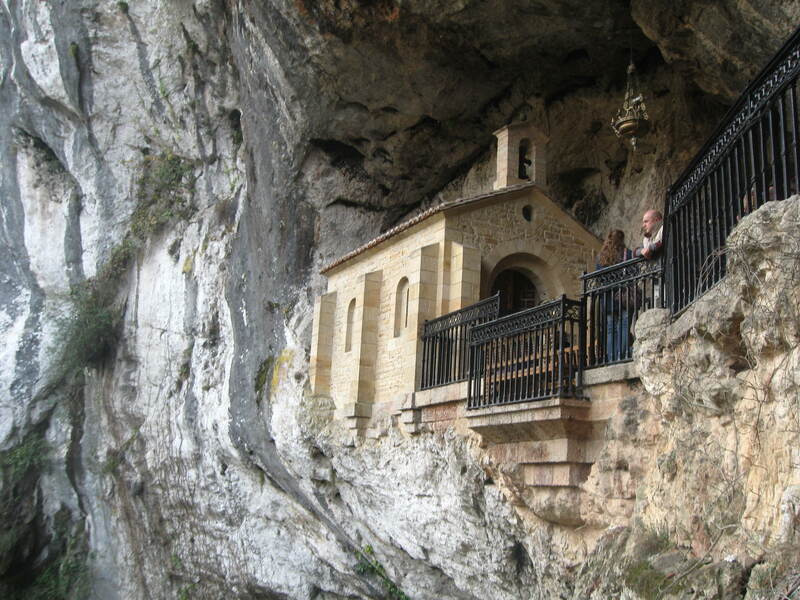 As if it weren’t beautiful enough, next door is a small church (Santa Cueva de Covadonga). I found it much more fascinating and impressive. I can’t wait to go back, as I have yet to discover the Lagos de Covadonga nearby. The two glacial lakes, the original centre of the Picos de Europa National Park, are said to be some of the most beautiful in all of Spain and are often an important part of Spain’s cycling competition, La vuelta de España. Cudillero is a small village of around 6000 people built into the side of a hill right on the sea. It is said to be founded by vikings. It’s notable for the brightly coloured houses and its seafood restaurants. I enjoyed getting lost in the rain trying to find a shortcut back to the FEVE train station. I found another one just as the sun came out. It’s on the Camino de Santiago, so I’ll be able to return as soon as I get the chance to hit the Camino for real. It’s located between Gijón and Galicia. Located between Gijón and Cantabria close to Llanes, Ribadasella is another small town of around 6000 people located on the sea. It offered a great view of the sunset and is home to a famous rowing race on the River Sella every August. For me, it just had stunning views of the sea. 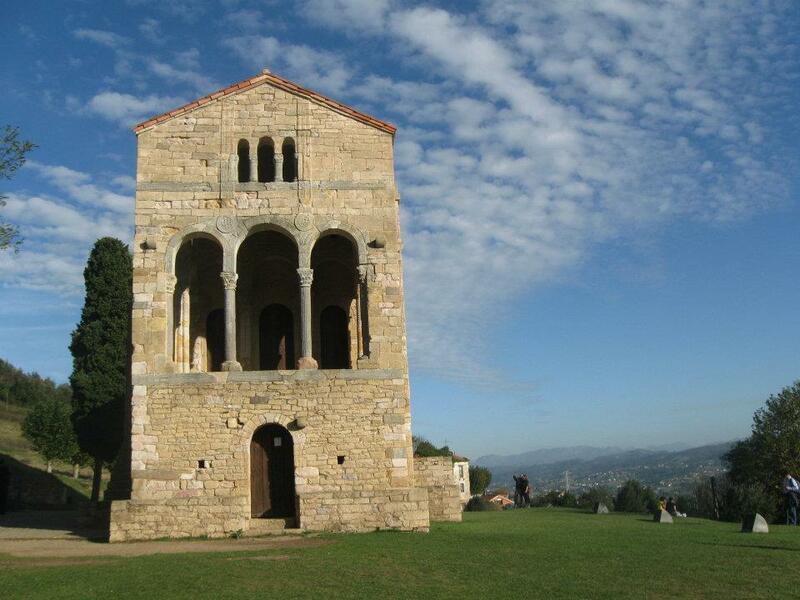 This UNESCO World Heritage site is a short 3 km (1.9 mile) hike from Oviedo city, but there are buses every hour for the less adventurous. It was originally a palace before being converted into a church in the 13th century and is unique among architecture of its time. It also has some awesome views of Oviedo on those few precious sunny days. Also of note, famed football (soccer) player David Villa is from Asturias, and every day the dialect of “bable” gets more respect. Puxa Asturies! Castellón, that other Valencian province. Castellón has a lot of unspoiled beauty (and an infamous airport that may never be used, but that’s neither hear nor there.) It has a lot of beautiful beaches, and it is also home to some beautiful mountains. Like Valencia, it has 300 days of sun a year but is a lot less touristy. While the capital city is nothing to write home about, the rest of the province makes a great holiday destination. Peñíscola reminds me of a San Sebastián-Donostia, only smaller and even more quaint and precious. It even has its own film festival. Located almost in Catalunya, Peñíscola is so charming and beautiful that various films, including El Cid, have been filmed here. Although it is considered one of the most beautiful “pueblos” (villages) in Spain with a population of 8000 people, it’s technically a city thanks to Felipe V in the War of Spanish Succession. 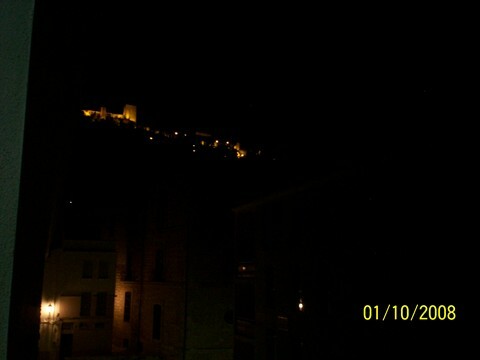 During the time of two popes, the Pope Benedict XIII (Papa de Luna) called the castle in Peñíscola his home. Although I was only here once on an excursion with my school, Peñíscola remains one of my favourite pueblos in all of Spain. Morella is one of the hardest to reach villages I have ever been to, but I was not about to leave Comunitat Valenciana without visiting this medieval jewel. I had to wake up super early to take the Cercanías train to Castellón and then catch an early bus to Morella that took about two hours. It went through some of the most rural landscapes of País Valencia. The village (which has less than 3000 people living there) is built into a hill with a castle on the top and conserves its medieval streets and feel. Valenciano is definitely the language of the streets here, but they don’t mind if you speak Spanish. (I tried my valenciano, of course!) Every six years, they celebrate a Sexenni festival. Last celebrated in 2012, these festivals originally began to celebrate the fact that a statute of the Virgin Mary drove the black plague from the village. Segorbe is a nice little village of 9000 people located between Valencia capital and Teruel, and I highly recommend stopping here along the way. There isn’t a lot to see, but there are some beautiful views if you’re wanting to climb. If you’re going by bus, however, I strongly urge you to ask the bus driver just where to catch the bus back to Valencia to avoid any confusion. I speak from experience after having unexpectedly to stay the night there because everyone in the town told me a different story about where to catch the bus to Valencia! I still think it’s a nice little village. Although La Vall d’Uixò seems like a sleepy little place, the small city does feature something incredible: The Saint Joseph Caves! These caves feature a navegable river around 5 km long. The Caves are some of the coolest I’ve seen, and I grew up visiting Mammoth Cave. The Coves de Sant Josep are definitely not as big, but there are worth a visit. Villareal is a small city of 50,000 people that is like so many Spanish cities of its size. Industrial and not much to write home about. However, they do have one thing they can boast about. Their football team. In 1998, this small football club made its way to La Liga, the big boys, and found themselves playing against teams like the putrid, horrible Real Madrid and the amazing, awesome and fantastic Barcelona FC and València. (What? I’m not bias! Really!) Although they’ve made a few return visits to Second Division, they always find their way back to Primera División, where I think they belong. They’ve even made it to Champions a few times. I got the chance to visit their stadium, El Madrigal, to see them defeat Malaga. Amunt Vila-real! Benicàssim is a coastal village that attracts many Spanish tourists due to its beaches and music festivals. 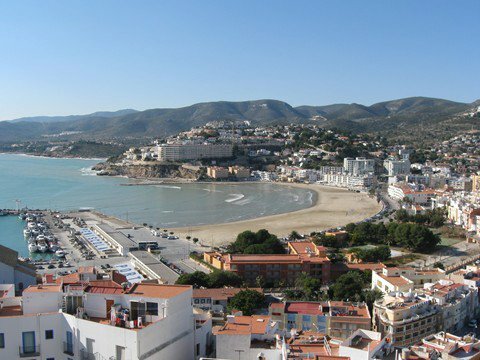 It’s located just 13 kilometres (7 miles) from the Castellón capital. It offers something for everyone, from hiking and biking trails to the beautiful beaches. I hope to visit soon. 25 kilometres (15 miles) from Castellón de la Plana, Vilafamés is another medieval mountain village with beautiful buildings, ermitas and a castle. It doesn’t have quite the fame as Morella, but it looks amazingly beautiful, and I’m going to have to make a visit there on my next trip to Castellón. As much as I try, there are just too many beautiful places in every part of Spain to be able to visit them all. That doesn’t stop me from trying! A relaxing cup of café con leche in Bilbao. You can take a relaxing café con leche in Plaza Nueva! Lucky for me, Bilbao has so many cool places to have this delicious treat. Here are a few of my favourite place to indulge. Most of them come with free wifi if I want to sit and write a while. 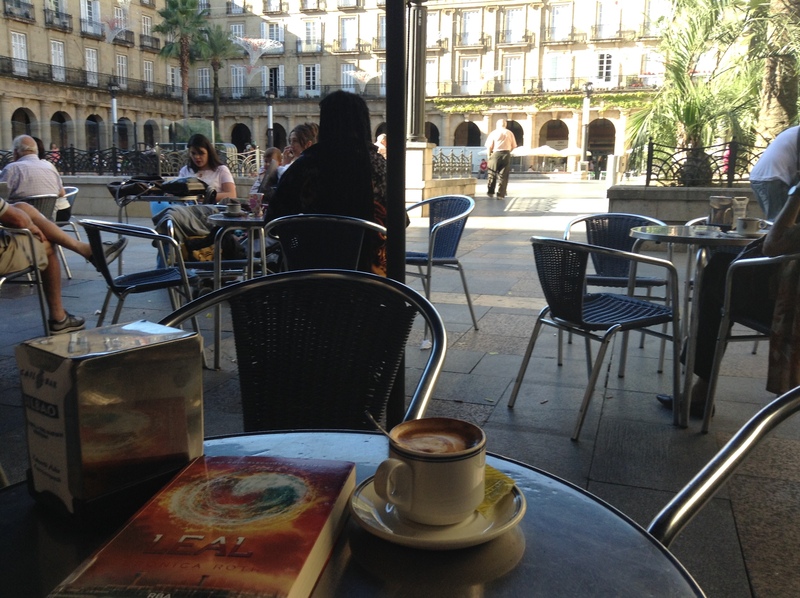 I also like to grab a table on a terraza to read a great book on those three days of sun per year in Euskadi. These are not in any particular order of greatness, but they are all pretty awesome in my opinion. Tengo suerte, porque Bilbao tiene muchos sitios chulos para tomar un café rico. Aquí tenéis algunos de mis sitios preferidos para tomarme el café. La mayoria tiene wifi gratis si quiero sentarme y escribir un rato. También me gusta leer en una terraza en estos tres días de sol de Euskadi cada año. No hay un orden a cual es el mejor, pero todos están geniales en mi opinion. Although there is no terraza, you can sit in the windows on nice days. It’s gay-friendly (and straight-friendly), the baristas are nice, and there is free wi-fi. A café con leche costs 1.40€, 1.50 if you want it on ice. Most baristas know me by drink as I frequent the establishment to work on my writings so much. It can be found at Calle La Naja 7. Aunque no haya terraza uno se puede sentar en las ventanas los días buenos. Es gay-friendly (y hetero-friendly), los cameros son majos, y hay wifi gratis. Un café con leche cuesta 1,40 y 1,40 si quieres hielo. La mayoria de los camareros me conocen por mi bebida porque voy allí para escribir tanto. A short walk from the Café Nervión along la Ría Nervión you’ll find the Bar Marzana 16, located at Calle Marzana 16. I like the retro atmosphere inside, and the terraza is almost always packed due to the views of the river, especially on weekend afternoons when the weather is cooperating. A café con leche is 1.50€, and there is wifi. This bar has a bit of a bohemian vibe, but the clientele is varied from bohemians to pijos in their Zara to little old ladies. Cerca del Café Nervión a lado de la Ría Nervión se encuentra el Bar Marzana 16, situado a Calle Marazana 16. Me gusta el ambiente dentro, y la terraza siempre está llena de gente dado a las vistas de la ría, especialmente por las tardes de los fines de semana cuando hace bueno. Un café con leche cuesta 1,50, y hay wifi. El bar es un poco bohemio, pero los clientes son varios, desde bohemios a pijos con su Zara a las señoras que les gusta su café por la tarde. 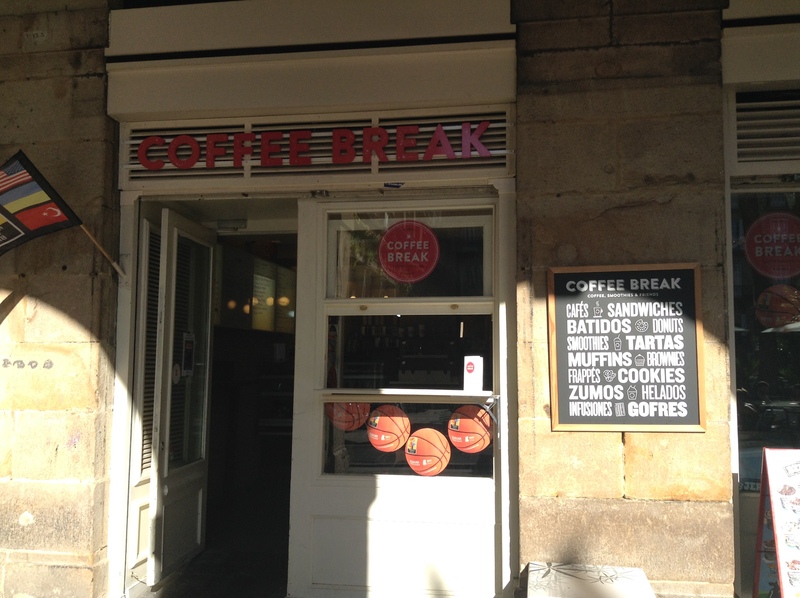 Before Starbucks opened in 2015, Coffee Break was called the Starbucks of Bilbao.There are tons of baked goods on display, and they have various types of overpriced coffee. There is free wifi, and at their location in Plaza Nueva, there are plenty of places to plug in your laptop as you work or surf the net. The other locations are a bit smaller, and I’ve never been. (There’s one on Gran Vía and another in Indautxu that just opened.) While their café con leche is a bit expensive at 1.60€, it does come in a bigger glass and with the option of soy milk and “sin lactosa” for those lactose intolerant people. It’s almost always packed due to its prime location in Plaza Nueva. Antes de el Starbucks por Gran Vía abrió en 2015, Coffee Break era el Starbucks de Bilbao. Hay muchos pasteles y tiene varios tipos de café demasiado caro. Hay wifi gratis, y en su ubicación en Plaza Nueva, hay muchos sitios para enchufar el portatil mientras trabajas o navegar por internet. Hay otros Coffee Breaks en Gran Via y Indautxu, pero nunca he estado. Son más pequeños. Mientras su café con leche es un poco caro a 1,60€, viene en un vaso más grande y con la opción de leche de soja y sin lactosa. Siempre está lleno de gente dado de su situación por Plaza Nueva. One of the classic bars in Bilbao, a bar that takes its name from the city offers great pintxos and a great old-school vibe. By old school, I mean 1911 when it opened. Although it was restored in 1992 during the renovation of the entire city of Bilbao, it still reminds me of the days of yore. There is service on the terraza. A café con leche is 1.40€, and it’s located in the heart of Plaza Nueva. (You can’t miss the bright blue.) Uno de los bares clásicos de Bilbo, un bar que toma su nombre de la ciudad ofrece pintxos ricos y un ambiente clásico. Se abrió las puertas en 1911. Aunque lo renovaron en 1992 durante la renovación de la ciudad de Bilbao, todavía me recuerda del años pasados. Hay servicio de terraza. Un café con leche cuesta 1,40€, y está en el centro de Plaza Nueva. Busca el azul. Located at Sendeja Kalea (or Calle Sendeja) 3 across from the plaza Arenal near Casco Viejo is my favourite bar to curl up with a café con leche (1.30€ or 1.50 with soy milk) and read. They have the best pintxo of tortilla con jamón york y queso in Bilbao, and the establishment is gay-friendly (and hetero-friendly too.) They have a terraza. The place may look familiar because it was apparently featured on the Spanish cooking reality show Pesadilla en la Cocina in 2012, a sore subject with the bar’s owners. Who knew? They also have a killer tostada con tomate for breakfast (along with Opila). The owners also manage Opila next door. (Closed april 2015/cerrado abril de e2015). Situado en Sendeja Kalea 3 enfrente de Arenal cerca de Casco viejo es mi bar preferido para tomar un café con leche (1,30 o 1,50 con leche de soja) y leer. Tiene el mejor pintxo de tortilla con jamón york y queso en Bilbao, y es gay-friendly (y también hetero-friendly). Hay terraza. Salió en un programa de cocinar español, Pesadilla en la Cocina en 2012, que es un mala tema con los dueños. También ofrece una tostada con tomate. Los dueños también tiene Opila, una panadería a lado. While La Reina is more known for pintxos and drinks, the café and bakery next door Opila, at Sendeja 4, offers some of the best pasteries and bread Bilbao has to offer. The prices are the same for a café con leche, and I sometimes go here if I need to buy some bread (I usually get the baguette de 8 Cereales, and if I have to translate that into English…) They also have a killer napolitana when my sweet tooth is taking over my brain. The upstairs is great for reading on rainy days, and it’s also great to chill with your friends. Mientras La Reina es más conocida por sus pintxos y copas, el café y panadería a lado, Opila, en Sendeja 4, ofrece algunos de los mejores pasteles de Bilbao. Los precios son iguales para un café con leche, y voy aquí para comprar pan (usualmente el baguette de 8 Cereales). Bread and Coffee is a small, cozy café and bakery located near the Alhóndiga. It may be small, but the service and quality of food are both excellent. Every time I take books back to the Alhóndiga, I stop here to read a while and play on the wifi. It’s located at General Concha 7. A café con leche is 1,30, and if you want soy milk, it’s only ten cents more. 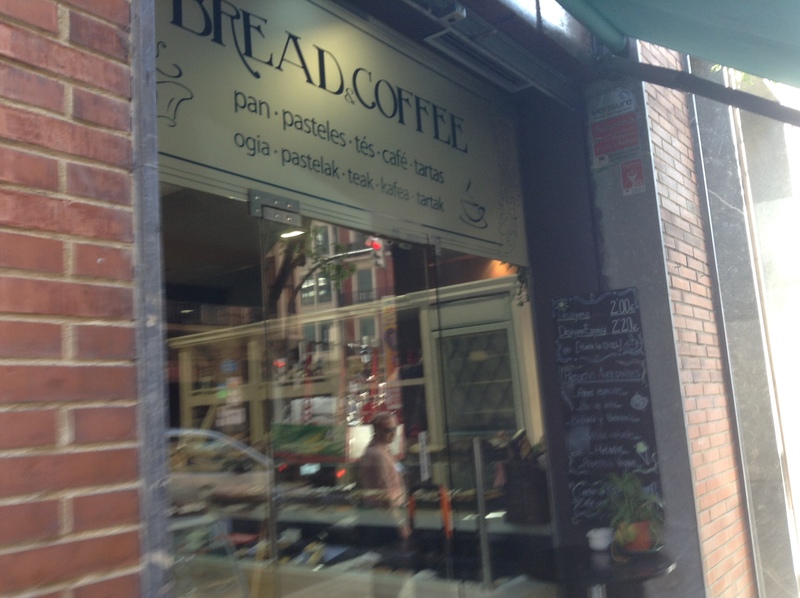 El Bread and Coffee es un sitio pequeño y cómodo café y panadería cerca a la Alhóndiga. Aunque es pequeño, la atención al cliente y calidad de la comida es excelente. Cada vez que devuelvo libros a la bilbioteca de la Alhóndiga, siempre paro aquí para tomarme un café y leer un rato y navegar con el wifi gratis. Está ubicado en la Calle General Concha 7. Un café con leche es 1,30, y 10 centímos más para leche de soja. I’m mentioning this bar more for the location, although the terraza is quite nice to sit and read on those three days of summer. It’s located in the Olabeaga barrio (Muelle de Olabeaga 22), which is the old Norwegian neighbourhood on the outskirts of Bilbao past San Mamés (Aupa Athletic). It’s well worth visiting just to check out the unique part of town, and the terrace allows you to sit and contemplate la Ría Nervión. A café con leche is 1,40, and there is wifi, although I haven’t used it. I plan to frequent this bar more in the future. Hablo de este bar por su situación, aunque la terraza está bien para sentarse y leer en los tres días de verano. Está en el barrio de Olabeaga (Muelle de Olabeaga 22), el barrio noreiga antiguo en las afueras de Bilbao pasando San Mamés. Vale la pena vistar para ver el barrio único, y la terraza te permita sentarse y contemplar la Ría Nervión. Un café con leche es 1,40€, y hay wifi. Espero ir allí más en el futuro. 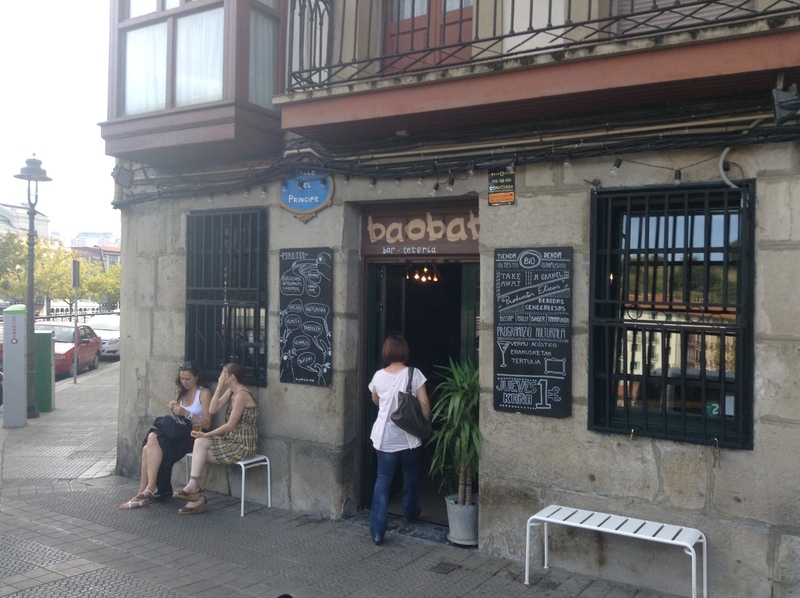 Baobab is a bit of an African bohemian mecca in the centre of Bilbao. Located on the river banks at Calle del Príncipe 1, Baobab is more known for its large variety of different teas than it is for its coffee. However, I still prefer my café con leche, and at 1.40€, it’s cheaper here than some other trendy cafés in the city. There is free wifi, and it is a good place to go to read in the afternoons. At nights, it’s usually packed. Soy milk and rice milk are both available. Baobab es un meca africano bohemio en el centro de Bilbao. Está ubicado en la Ría en Calle el Príncipe 1. Es conocido por su variedad de tes más que su cafe. Como prefiero mi café con leche, y como cuesta 1,40€, es más barato aquí que algunos cafes de moda. Hay wifi gratis, y es un buen sitio para ir para leer por las tardes. Por las noches, hay mucha gente. Leche de soja y de arroz está disponible. 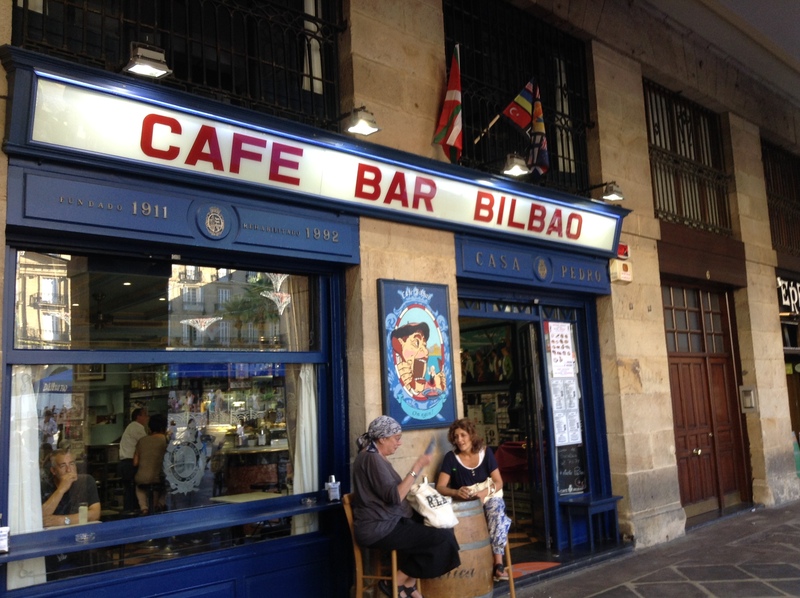 Any best of list of Bilbao wouldn’t be complete without mentioning the oldest café in Bilbao and one of the most famous. This was my first café in Bilbao in my first visit here in 2010 as it is mentioned in nearly every guide book. 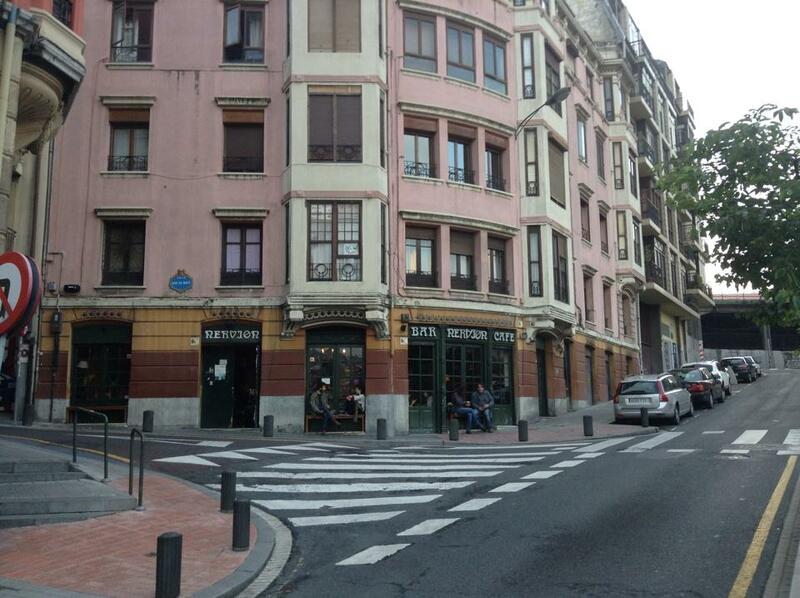 The café, located at Calle Berástegui 4 outside the Abando metro stop, keeps its original 1903 flavour and is the oldest café in Bilbao still running. 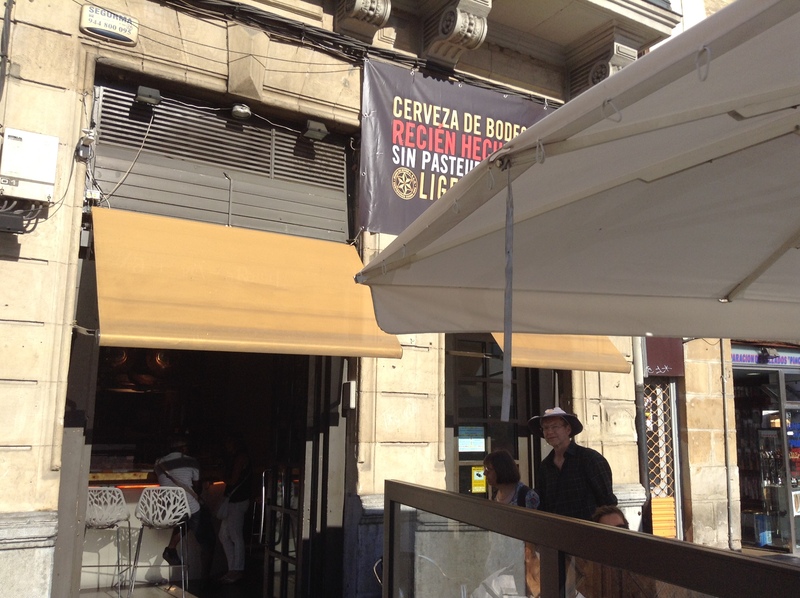 A café con leche is 1.60 as you’re paying for the atmosphere, but it’s well worth it. They are also famous for their Pintxo Moruno, which comes in either beef or lamb, for those wanting to make a meal of it. Cualquier lista de los mejores cafés de Bilbao serían incompleto sin mencionar el café más antiguo de Bilbao y uno de los más famosos. Era el primer café donde fui durante mi primera visita a Bilbao en 2010, como se lo menciona en todas las guías. El cafe, ubicado en Calle Berástegui 4 a lado de la parada de Metro de Abando, sigue con el estilo de 1903 y es el café más antiguo de Bilbao que sigue abierto. Un café con leche cuesta 1.60 como pagas el ambiente, pero vale la pena. También es famoso por su Pintxo Moruno, que viene en carne o cordero. With so many cool places like these, it’ll take me forever and a day to find all the great bars and cafés in Bilbao. Con tantos sitios chulos como estes, me va a tardar siempre para encontrar todos los bares y cafés en Bilbao. Jaén. The land of missed opportunities. Jaén is a province in Andalucía located in the middle of nowhere that not many people of Spain have heard of and not many people in Spain know anything about. 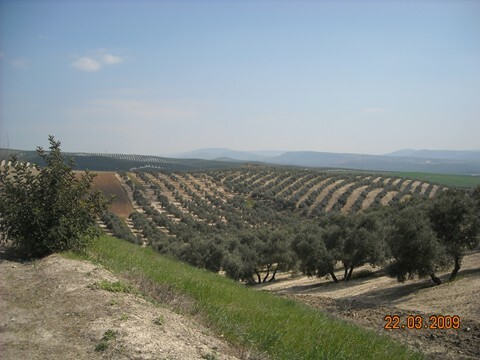 It has more olive trees than people, which means it has some of the best olive oil in an entire country known for its olive oil. It also means that when I was 26 and assigned a school in Linares, the second biggest city of the province at 60,000 (half the size of the capital city Jaén), I freaked out. How young and naïve I was. 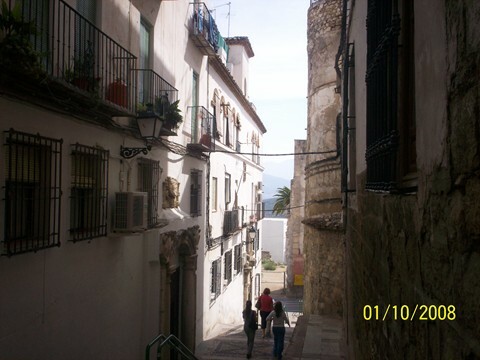 When I got to Jaén, I was amazed by how beautiful it actually was. True, their Spanish is hard to understand (I had maybe a B2 then, Upper intermediate.). 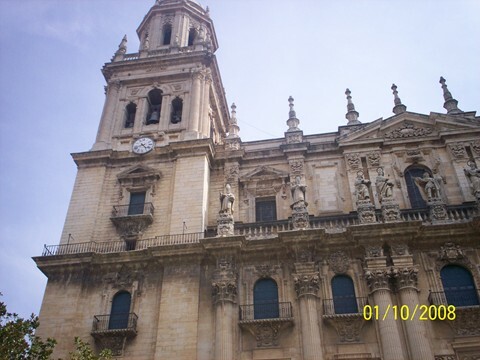 Compared to some parts of Andalucía, the Spanish in Jaén is quite easy to understand. The city is located in the mountains and has a vibe of being forgotten. Now? It sounds right up my alley. At the time, I had my heart on living in a big city like Madrid where I could feel free to be me, and in your mid-20s, the idea of Chueca still sounds like the opportunity of a lifetime. And I was sentenced to Jaén. During my time there, I got to tour an olive oil factory in Martos, which is a quaint typical Andalucían village. I found myself exploring Andújar in the middle of Carnival. And those three weeks of winter when it was only 10ºC/50ºF and we had no actual heat were some good times. However, I feel I missed out on what the province had to offer. I didn’t have the knowledge I know now about public transport in Spain. I also lived in a flat without internet, so I wasn’t able to explore my options. However, in 2008-2009, most of Jaén was in the dark about this invention called the internet. Seriously. There was an article in El País about how Jaén was the least connected province in Spain. One of these days, I’m going to go back there and visit the place I once called home. I hope to have a car, as that bus from Jaén capital to Linares was pretty darn scary…those back roads…on a bus…and to revisit the capital city and see those Set Meravelles that I never took the chance to see before. Jaén Capital: The capital city is a small, charming city worth visiting to get a glimpse of the real Andalucían life outside the more touristy Granada, Sevilla, Málaga and Córdoba. I never hiked up to see the castle that overlooks Jaén. One of these days, I want to rectify this grevious sin. Once upon a time, the Autovía del Suro (A-4) took you from Madrid to Andalucía through some sharp and steep curves and mountains that separated Castilla La Mancha from Andalucía. You still can see the amazing mountain views, but now that the new part has opened, the route is a whole lot safer (and a lot less nausea inducing). Úbeda is an incredible village of 36,000 habitants located in the heart of Jaén province and is a UNESCO World Heritage site. While I’ve seen its beauty from the bus to València, I regret not taking the time to walk around this breathtaking village. And whenever anyone talks about Úbeda, they almost always talk about it’s smaller sibling Baeza. At 17,000, it has even more of a small-town atmosphere while keeping all of the beauty. It shares the UNESCO World-Heritage site with Úbeda. La Sierra de Cazorla (Cazorla Mountains) is one of the most breathtaking natural parks in Spain. The namesake village and another village called La Iruela are beautiful places to start the journey to this incredible mountain range. I cannot wait to go back to Jaén and correct all my youthful mistakes. Madrid. City, province, autonomous community. I’m just going to be flat-out honest. I do not like the city of Madrid. Part of the reason is while I like to visit big cities, living there is different. I did not have a good experience living there. I don’t like either football team (in fact, I downright hate Real Madrid with a passion that I will support any team or anything that is playing them.) I find that some (note SOME, not ALL, before the angry commenters come in) people in the city proper are everything they complain that the rest of Spain is (lazier than the andaluces, faker than the andaluces, stingier than the catalanes, colder than the Spanish from the north coast…). They pride themselves on being “open” but I found it next to impossible to find actual friends in the three years I had to call the city “home”. I never felt more than a tourist (another thing I don’t like), whereas both Valencia and Bilbao felt like home immediately. Madrid is a city that never sleeps, and although they don’t understand the comparasion, I find it to be a Spanish New York City. Tons of people and things to see and do, but unless you have a good group of friends and/or family by your side, you’re always going to feel like an outsider. On the other hand, the people in the villages and small towns in the province/autonomous comunidad de Madrid are some of the most friendly, most open and charming people you will ever meet. The mountain villages north of the city are incredibly beautiful and offer a stark contrast to the hustle and bustle of the city that gives the province its name. Every chance I got, I went to visit a village near the city. I also worked in a village just south of the city (45 minute commute) in one of the best schools one could ever hope find. So I want to make clear that if I am complaining about Madrid, it is for the capital city and NOT the rest of the comunidad. Madrid the city does offer a lot for visitors, I will admit. There is the Palacio Real, Parque Retiro, Museo de Prado, Museo de Reina Sofía, Parque de Oeste (so much better than Retiro), Templo de Debod, Gran Vía, Puerta del Sol and relaxing cafés con leche in Plaza Mayor. There are many barrios for partying. Chueca (for the gays pijos, or posh/snooty gays), La Latina (for everyone and more and more for the normal gays), Malasaña (the alternative barrio), or Huertas (for the tourists). The gardens at Atocha (the train station) are remarkable. The metro line, although always too crowded at any hour of day, will get you where you need to go. However, I prefer off the beaten path. There could be Set Meravelles for the city, sure. (Gran Vía, Parque de Oeste, Chamberi Metro Station is a closed metro station that takes you to the past and only locals visit, Puerta del Sol, Prado, Gardens de Atocha, La Latina/Chueca/Malasaña, etc etc etc.) I’m going to suggest Set Meravelles outside the hustle and bustle of the city, the REAL Madrid, the places that will give an opportunity to escape the madness. Some of them are quite popular destinations already. Some of them aren’ t known to people who don’t live in Madrid. All of them are worth a visit. La Pedriza is part of the Guadarrama mountains in the north of Madrid. It offers amazing hiking trails and scenery. It’s famous for its granite rock formations. I’ve been on several day trips here, and it’s located next to the village Manzanares el Real, which is amazing in its own right. Speak of the devil. Manzanares is the gate to La Pedriza and a quaint village of 7000 inhabitants located about 45 minutes north of Madrid city. It has a well-preserved medieval castle. The first time I ventured here was on my 28th birthday. It wasn’t my last. Chinchón is a small village of around 5000 people located 50 kilometres (30 miles) southeast of Madrid, and it has a famous circular plaza where that infamous Spanish tradition of bullfighting takes place from time to time. It’s also famous for its chinchón anis and a castle now closed to the public. It’s a great getaway from the city. The “beach” of Madrid. The Pantano de San Juan is located next to the village of San Martín de Valdeiglesias an hour or so southwest of Madrid and is a reservoir with beautiful scenery. It’s popular with families, and in certain areas, popular with naturists (I.E. there is a nudist part away from the families). It’s the closest you’re going to get to the beach in Madrid. It’s the only reservoir (embalse) that allows swimming in the entire Comunidad de Madrid. Someone was an idiot and has no photos of the small city of Alcalá de Henares, which is 35 kilometres or 22 miles northeast of Madrid on the way to Guadalajara . I always meant to go back, but never got around to it. It is famous because it’s the birthplace of Miguel de Cervantes, he who doth wrote that great novel Don Quixote. It’s also the biggest city in Madrid outside Madrid. It also has a university and a population of white storks. 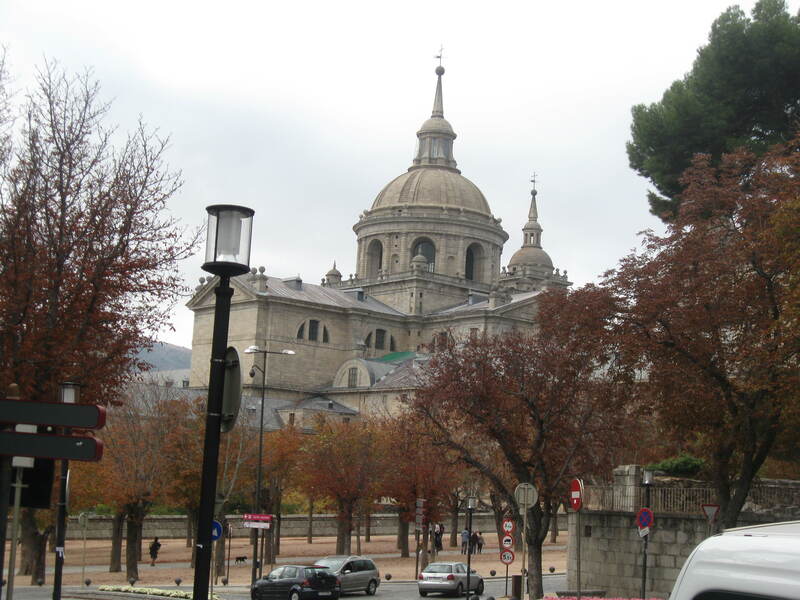 El Escorial is a monastery in San Lorenzo de El Escorial, a village of 18,000 people located 48 km/28 miles north of Madrid and is quite well connected with the capital by bus and Cercanías trains. Felipe II was the one responsible for its construction, which took many, many, many years. It is a World Heritage site with 500,000 annual visitors. I do agree with the popularity as it is amazing architecture, and the village is pretty damn cool itself. A village of less than 400 people located 60 KM (36 miles) north of Madrid, Patones is one of the coolest places I have seen in my life. It’s not well-communicated by public transport (you’ll have to get up extra early to catch the bus, but it is worth the effort to get here. The village is unique because it is constructed almost entirely from black slate, and to enter, you have to park the car outside the village and walk a few metres. It’s a popular day trip for the madrileños, but very few people outside the natives even know about it. It’s one of the best kept secrets. Sorry for spilling.